The Split Phase Motor is also known as a Resistance Start Motor. It has a single cage rotor, and its stator has two windings known as main winding and starting winding. Both the windings are displaced 90 degrees in space. The main winding has very low resistance and a high inductive reactance whereas the starting winding has high resistance and low inductive reactance.The Connection Diagram of the motor is shown below. A resistor is connected in series with the auxiliary winding. The current in the two windings is not equal as a result the rotating field is not uniform. Hence, the starting torque is small, of the order of 1.5 to 2 times of the started running torque. At the starting of the motor both the windings are connected in parallel. As soon as the motor reaches the speed of about 70 to 80 % of the synchronous speed the starting winding is disconnected automatically from the supply mains. 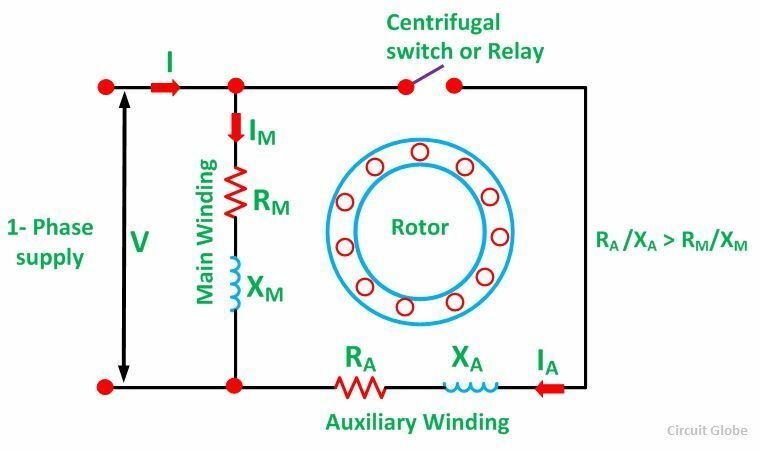 If the motors are rated about 100 Watt or more, a centrifugal switch is used to disconnect the starting winding and for the smaller rating motors relay is used for the disconnecting of the winding. A relay is connected in series with the main winding. At the starting, the heavy current flows in the circuit, and the contact of the relay gets closed. Thus, the starting winding is in the circuit, and as the motor attains the predetermined speed, the current in the relay starts decreasing. Therefore, the relay opens and disconnects the auxiliary winding from the supply, making the motor runs on the main winding only. The phasor diagram of the Split Phase Induction Motor is shown below. 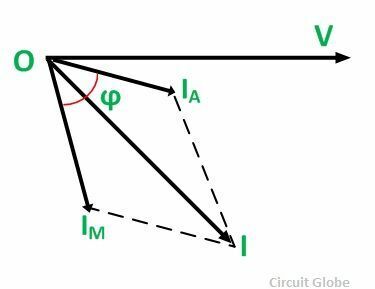 The current in the main winding (IM) lag behind the supply voltage V almost by the 90-degree angle. The current in the auxiliary winding IA is approximately in phase with the line voltage. Thus, there exists the time difference between the currents of the two windings. The time phase difference ϕ is not 90 degrees, but of the order of 30 degrees. This phase difference is enough to produce a rotating magnetic field. The Torque Speed Characteristic of the Split Phase motor is shown below. Here, n0 is the point at which the centrifugal switch operates. The starting torque of the resistance start motor is about 1.5 times of the full load torque. 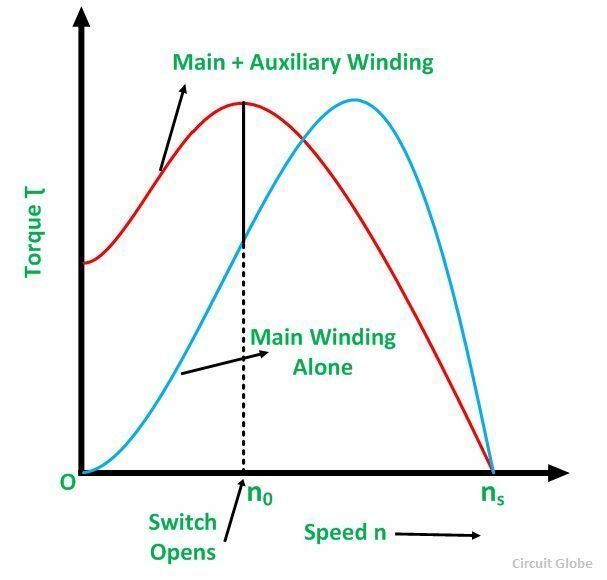 The maximum torque is about 2.5 times of the full load torque at about 75% of the synchronous speed. The starting current of the motor is high about 7 to 8 times of the full load value. The direction of the Resistance Start motor can be reversed by reversing the line connection of either the main winding or the starting winding. The reversal of the motor is possible at the standstill condition only. Used in the washing machine, and air conditioning fans. The motors are used in mixer grinder, floor polishers.